Basic Description: This extremely partisan Republican group is strongly conservative on economic and social policy and favors an assertive foreign policy. They are highly engaged in politics, most (72%) agree with the Tea Party, 54% regularly watch Fox News, and nearly half (47%) believe that President Obama was born outside the U.S. Defining values: Extremely critical of the federal government and supportive of sharply limited government. Pro-business and strongly opposed to environmental regulation. Believe that military strength is the best way to ensure peace. Highly religious; most say homosexuality should be discouraged by society. Who they are: More than nine-in-ten (92%) non-Hispanic white and 56% male. The oldest of the groups (61% ages 50 and older). Married (79%), Protestant (72%, including 43% white evangelical), and financially comfortable (70% say paying the bills is not a problem). Lifestyle notes: Many are gun owners (57%) and regular churchgoers (57% attend weekly or more often), and fully 81% are homeowners. More watch Glenn Beck (23%) and listen to Rush Limbaugh (21%) than any other group. Basic Description: Concentrated in the South and Midwest. Main Street Republicans differ from Staunch Conservatives in the degree of their conservatism and in their skepticism about business. They are socially and fiscally conservative but supportive of government efforts to protect the environment. Defining values: Highly critical of government. Very religious and strongly committed to traditional social values. 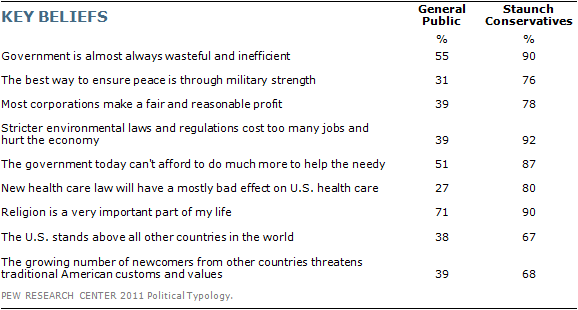 Generally negative about immigrants and mostly opposed to social welfare programs. But much less enamored of business than Staunch Conservatives, and less supportive of an assertive foreign policy. Who they are: Predominantly non-Hispanic white (88%), with two-thirds living in the South (40%) or Midwest (27%). A majority are Protestant (65%, including 38% white evangelical). 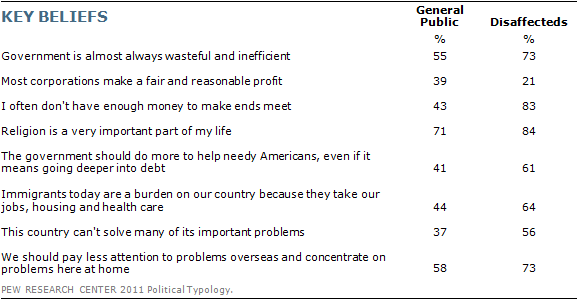 A large majority (69%) are generally satisfied financially. Lifestyle notes: Most (84%) are homeowners. About half are gun owners (51%) and regular churchgoers (53% attend weekly or more often). Nearly a quarter (24%) follow NASCAR racing. About half (51%) watch network evening news. Basic Description: This Republican-oriented, predominantly male group mostly conforms to the classic profile of the libertarian in its combination of strong economic conservatism and relatively liberal views on social issues. 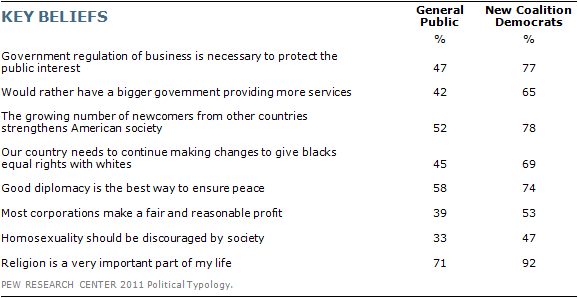 Much less religious than other GOP-oriented groups, Libertarians are relatively comfortable financially– nearly half (46%) say they are professional or business class, among the highest of the typology groups. Defining values: Highly critical of government. Disapprove of social welfare programs. Pro-business and strongly opposed to regulation. Accepting of homosexuality. 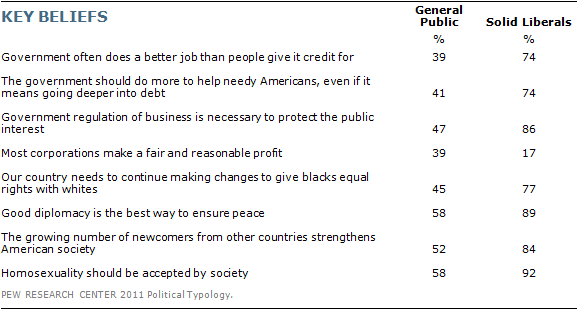 Moderate views about immigrants compared with other Republican-oriented groups. Who they are: Most (85%) are non-Hispanic white and two-thirds (67%) are male. Well educated (71% have attended college) and affluent (39% have incomes of $75,000 or more). Lifestyle notes: Less likely than other GOP groups to attend church weekly (26%). More than half (56%) use social networking sites, and 46% have a gun in the household. 54% currently have a U.S. passport. 36% trade stocks. 38% regularly watch Fox News and 17% regularly listen to NPR. Basic Description: The most financially stressed of the eight typology groups, Disaffecteds are very critical of both business and government. They are sympathetic to the poor and supportive of social welfare programs. Most are skeptical about immigrants and doubtful that the U.S. can solve its current problems. They are pessimistic about their own financial future. 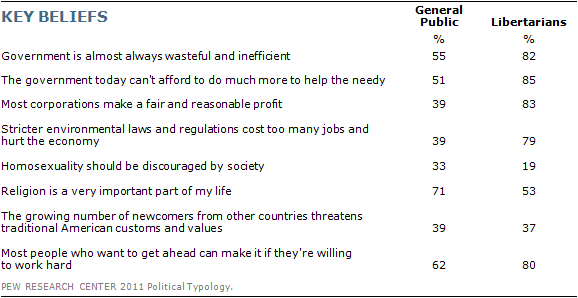 Defining values: A majority believe that the government is wasteful and inefficient and that regulation does more harm than good. But nearly all say too much power is concentrated in a few companies. Religious and socially conservative. Lifestyle notes: Only 26% have a U.S. passport. 23% follow NASCAR. 41% did not vote in 2010. Basic Description: Well-educated and financially comfortable. Post-Moderns are supportive of many aspects of government though they take conservative positions on questions about racial policy and the social safety net. Very liberal on social issues. Post-Moderns were strong supporters of Barack Obama in 2008, but turned out at far lower rates in 2010. Defining values: Strongly supportive of regulation and environmental protection. Favor the use of diplomacy rather than military force to ensure peace. Generally positive about immigrants and their contributions to society. Who they are: The youngest of the typology groups (32% under age 30); a majority are non-Hispanic white (70%) and have at least some college experience (71%). Nearly a third (31%) are unaffiliated with any religious tradition. Half live in either the Northeast (25%) or the West (25%). A majority (58%) lives in the suburbs. Lifestyle notes: 63% use social networking. One-in-five (20%) regularly listen to NPR, 14% regularly watch The Daily Show, 10% read the New York Times. 31% trade stocks and 53% have a passport. Basic Description: This majority-minority group is highly religious and financially stressed. They are generally upbeat about both the country’s ability to solve problems and an individual’s ability to get ahead through hard work. 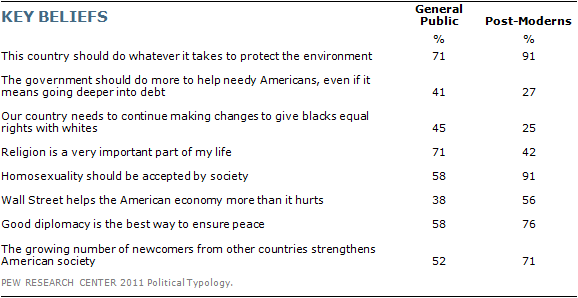 Defining values: Generally supportive of government, but divided over expanding the social safety net. Reflecting their own diverse makeup, they are pro-immigrant. Socially conservative, about as many say homosexuality should be discouraged as say it should be accepted. Who they are: Nearly equal proportions white (34%), black (30%) and Latino (26%); about three in ten (29%) are first- or second-generation Americans. 55% have only a high school education or less. Nearly a quarter (23%) are not registered to vote. Lifestyle notes: Half (50%) are regular volunteers for charity or non-profit groups. More than a quarter (27%) are looking for work or would prefer a full-time job to the part-time job they currently hold. Only 34% read a daily newspaper. 25% regularly listen to NPR. 34% buy organic foods. Basic Description: This largely blue-collar Democratic group is struggling financially and is generally cynical about government. Nearly half (47%) expect that they will not earn enough to lead the kind of life they want. Socially conservative and very religious. Defining values: Critical of both business and government. View immigrants as an economic burden and a cultural threat. Supportive of environmental protection in general but concerned about the economic impact of environmental laws and regulations. Who they are: A sizable number are non-Hispanic African American (35%), while 53% are non-Hispanic white. About seven-in-ten live in the South (48%) or Midwest (23%). Most (61%) are female. Two-thirds (68%) have only a high school education or less. Lifestyle notes: Only 28% have a U.S. passport. More than four-in-ten (43%) describe their household as “struggling.” About one-in-five (21%) are currently out of work and seeking a job. 23% follow NASCAR. 61% regularly watch network evening news and 44% watch CNN. Basic Description: Politically engaged, Solid Liberals are strongly pro-government and hold liberal positions across the full range of political issues. They are one of the most secular groups. 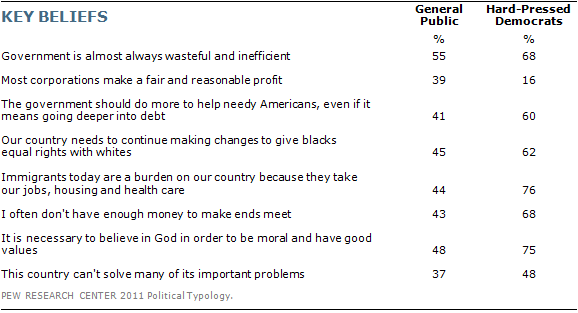 Two-thirds (67%) say they disagree with the Tea Party. Defining values: Very supportive of regulation, environmental protection and government assistance to the poor. Socially tolerant, supportive of the growing racial and ethnic diversity of the country. A majority (59%) say that religion is not that important to them. Who they are: Compared with the general public, more live in the Northeast (25%) and the West (28%). About half (49%) are college graduates , including 27% with post-graduate experience, the most of any group. 57% are female. Lifestyle notes: Less likely than any other group to watch Fox News. About a third (34%) regularly listen to NPR, 21% regularly watch The Daily Show, 18% regularly read the New York Times. Six-in ten(60%) use social networking sites. 59% have a U.S. passport; 21% are first- or second-generation Americans. Many (42%) regularly buy organic foods. Basic Description: Defined by their disengagement from the political process, either by choice or because they are ineligible to vote. They are highly unlikely to vote (61% say they seldom vote, and 39% volunteer that they never vote; none are currently registered to vote). Most follow government and public affairs only now and then (42%) or hardly at all (23%). Who they are: Bystanders are overwhelmingly young (51% are under 30) and nearly half are Latino (38%) or black (9%). A third (33%) are first- or second-generation Americans. They are diverse in their political views though they lean Democratic, and their values more often align with the Democratic than the Republican groups. They also have much more favorable attitudes about the Democratic Party and its political figures than about the Republican Party. More than half (54%) have incomes under $30,000 annually. Nearly two-thirds (64%) report that they or someone in their household were unemployed in the past year; 72% have only a high school education or less. Lifestyle notes: Only 24% regularly read a daily newspaper. About a third (35%) regularly watch network evening news. Only 33% own their home, while 36% are looking for work or would prefer a full-time job to a part-time job they currently hold. Compared with most other groups, relatively few (25%) have a gun in the household, trade stocks in the market (8%), or have a labor union member in the household (5%).